Is it odd that one day, I just woke up with the profound desire to make macarons? And this coming from a person who only had macarons two times in her life, and couldn’t even remember what they tasted like? Well that’s me. I guess my recent conversation about the meringue treat and all of those appetizing Pinterest pictures got me thinking of them. Another thing that intrigued me about the French cookie was the price. You go to any patisserie in Toronto and you’ll see macarons going for about $2.50. That’s kinda pricey for a 1 and a half inch treat. I’ve always heard that macarons are notoriously difficult to make. After watching countless YouTube videos on the subject and listening to all their dos and don’ts, I was ready to attempt the undertaking. In recent months, advertisements for the new live-action Cinderella film have been about the airwaves and interwebs. Cinderella has always been a special Disney movie for me, as it was the first one I owned on VHS. Yes, it was the late 80s. I still have the tape! Anyway, I used this as my inspiration for my macarons. 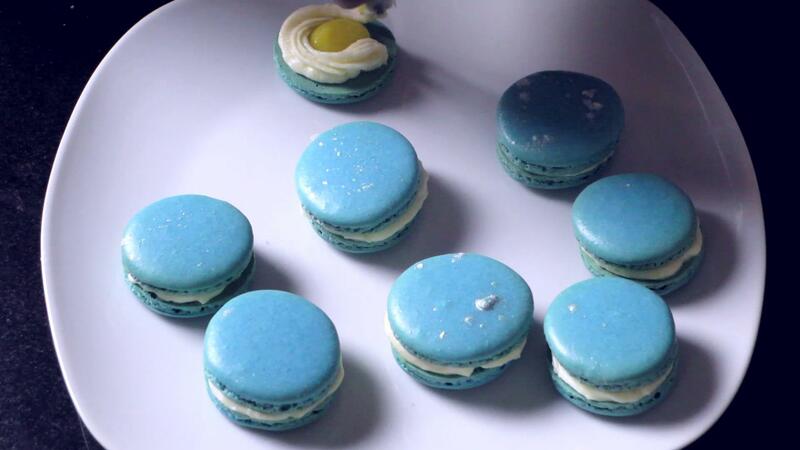 My macarons were going to be blue, just like Cinderella’s dress. I tried some of my sister’s Cinderella collection from MAC. Check out her new blog! Okay, let’s start with the shells. Mix almond flour and icing sugar in the bowl. Sieve them through in a different bowl. This step is ESSENTIAL – you want to have your flour combo nice and fluffy. 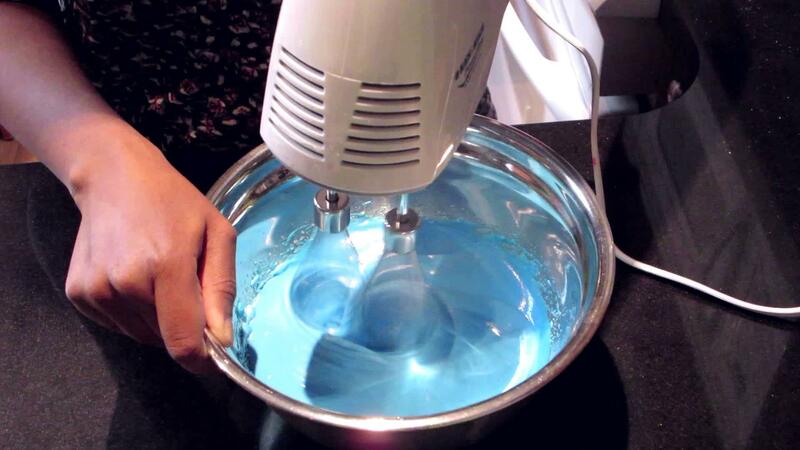 In a separate bowl, start beating your egg whites with a mixer to create the meringue. When it starts to get foamy, add your cream of tartar. While mixing, add the regular sugar little by little. 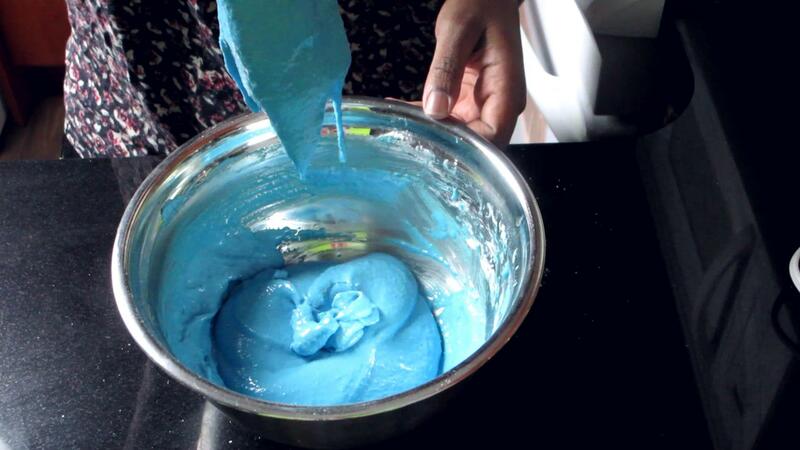 If you want to add gel food colouring, do it now. Keep beating the meringue until you’ve gotten stiff peaks. Now what do I mean by that? 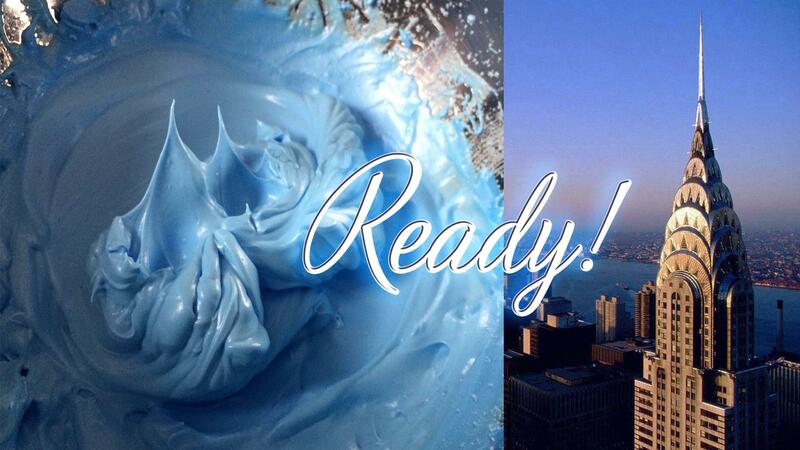 You want to mix the meringue until it is stiff enough to create peaks! You can check for his by lifting the beater from the meringue. If it sticks straight up, no dipping or curling, then you’ve got stiff peaks. 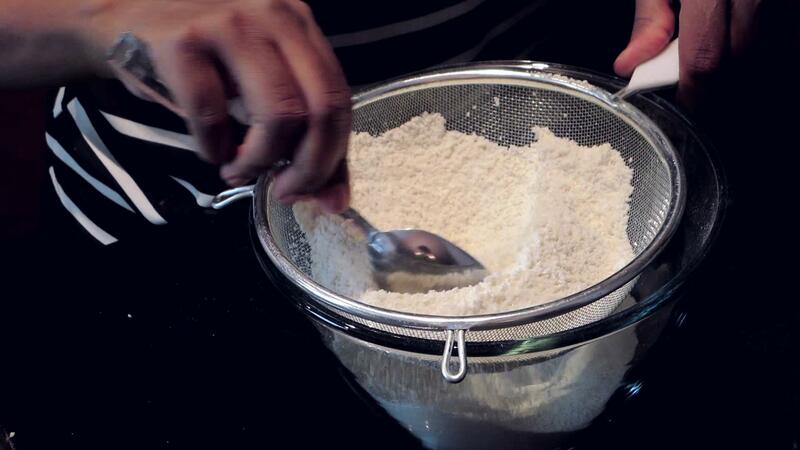 Once that’s done, you can add the flour/sugar combo to the bowl. With a cake spatula, start folding a mixing, and by that I mean combining the two in a circular manner. It will probably take you about 60 folds. Better than counting though, you know your mixture is ready when the batter can drip from the batter to the bowl in a slow but steady manner and the dripping makes an impression in the bowl. That part there is very crucial. If you get that part wrong, your macaron recipe will be for naught and forever ruined. 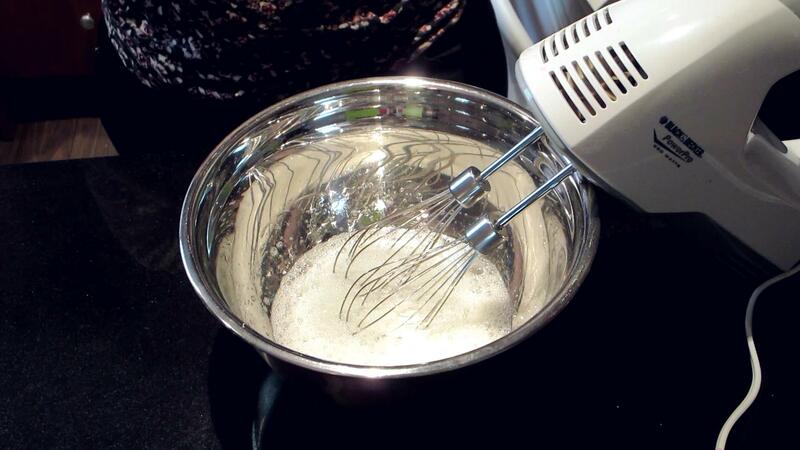 It’s the natural tendency to want to keep mixing a batter until it’s smooth. But because of the consistency of the almond flour, your macaron batter will never be smooth. At this point, preheat you oven at 300 degrees Fahrenheit. If you know your oven to run a bit on the hot side, drop it down 10 or 15 degrees. Prep your cookie sheet with parchment paper. 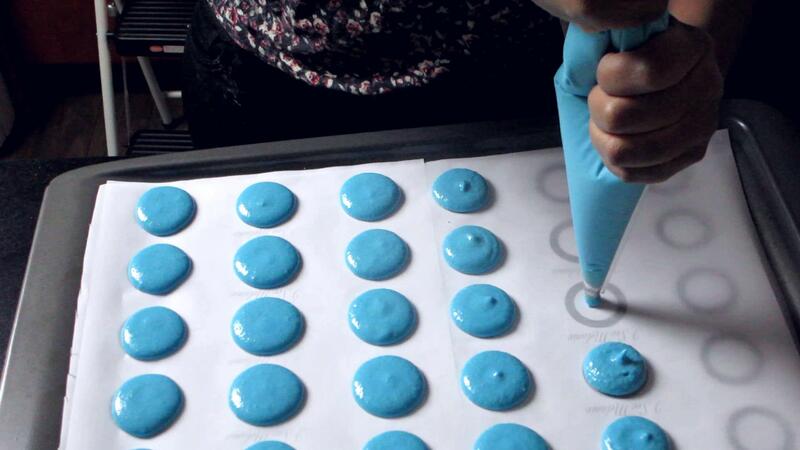 To make sure you get equal macaron shells, you can place a template under the parchment paper. I created that you can printout and use. Check it out here. Insert the batter into your piping bag. Now squeeze out the batter onto the cookie sheet. Keep each macaron shell about 1 inch apart from each other. After that, bang the cookie sheet on the counter at least 6 times. As hard as you can! This will let out the air bubbles that have formed in the shells. Sprinkle the pearl dust on the shells. I like to call the dust fairy godmother dust! Leave the cookie sheet out for at least 30 minutes. This is another necessary step. After the time is up, touch a macaron shell lightly with your finger. You should be able to do this without the batter running off on your finger. Put the cookie sheet on the middle rack of your oven for 8 minutes. After that, swing your cookie sheet around and leave in for another 8 minutes. Take the cookie sheet out of the oven. 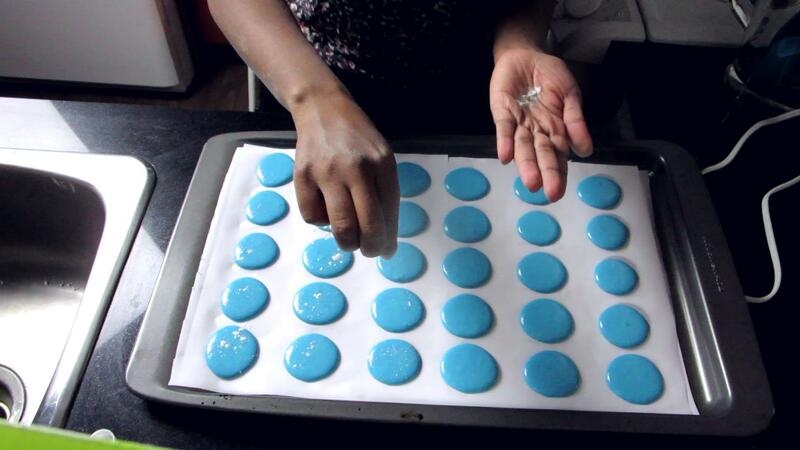 After a minute, place each macaron shell on a cooling rack. You’ll see that each shell has textured looking ridges. The French call them feet. This is a distinct feature of a well-crafted macaron! Now on to the filling! To make the cream cheese buttercream, start by beating the cream cheese for a few minutes. Then add the butter, then sugar, then vanilla extract. The complete beating process should only take about 10 minutes. Put it in the fridge for a few hours and you’re done. Easy, right? For the lemon curd, add all the ingredients except the zest to a metal bowl. Whisk the concoction while double-boiling. Once the butter has melted, add the lemon zest. Keep whisking for about 8 minutes. Do the spoon dip/finger test to make sure it’s cooked to the extent it needs to be cooked! Each filling will need its own piping bag. Pipe out the lemon curd in the centre of the shell. Pipe the buttercream around the curd. Get another shell to sandwich everything together. Your macaron is done!! Only work with room temperature egg whites – DO NOT use eggs that have come directly from the fridge. If you forget to leave the eggs out for 8 to 24 hours, place them in a bowl of warm water for 10 to 20 minutes. 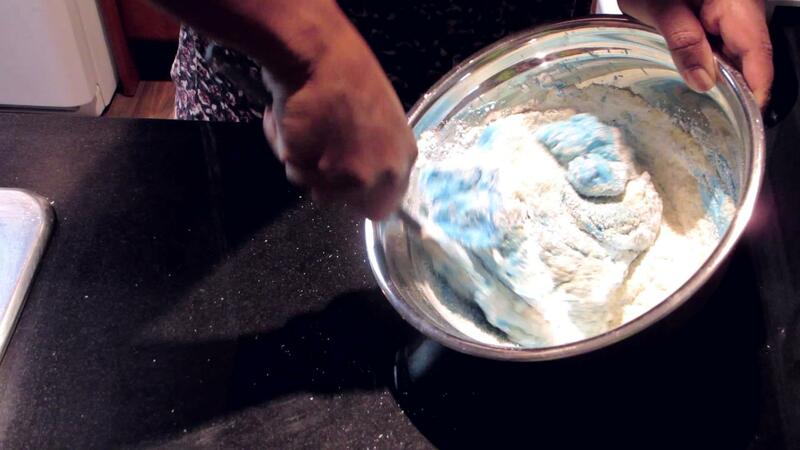 Make sure the meringues are whipped enough so that they create stiff peaks! Remember, think of the top of the Chrysler building! Mix the meringue/flour/icing sugar batter so that it can slip off your spatula in a smooth, consistent manner and it can make an impression once it hits the bowl. Rest the macaron shells on the cookie sheet for at least 30 minutes before you put them in the oven. If you follow those 4 steps, you’ll have yourself some good looking macarons. These fancy cookies are great for any Cinderella themed party you throw – a bridal shower, birthday party or wedding day! Don’t forget to check out my video on YouTube! ← DIY Phone Holder Using a Rainbow Loom Bracelet … Or Gimp!